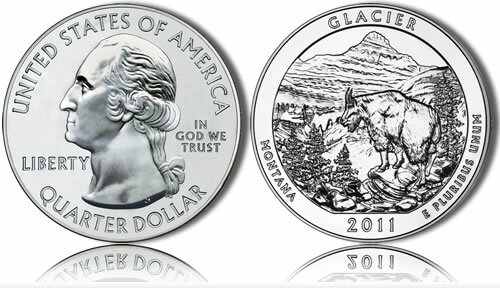 The Glacier National Park Silver Uncirculated Coin is the second 2011-dated silver coin in a series of five ounce collectible strikes from the United States Mint. This specific coin honors Glacier National Park of Montana. The United States Mint has scheduled its release for October 25, 2011. The collector uncirculated piece is a part of the US Mint America the Beautiful Five Ounce Uncirculated Coin Program which are the numismatic versions of the America the Beautiful Silver Bullion Coins™. Both series of coins are struck from five ounces of .999 fine silver and feature a reverse design emblematic of a selected site of national interest. A total of fifty-six sites have been chosen for the programs with one site representing each state as well as the District of Columbia and the five US territories. Five different coins are struck annually for each series which are scheduled to run from 2010-2021. The inscriptions of UNITED STATES OF AMERICA, LIBERTY, IN GOD WE TRUST and QUARTER DOLLAR surround a portrait of George Washington, the first President of the United States, on the obverse of each silver uncirculated coin. The portrait was designed by John Flanagan and first featured on the 1932 circulating quarter dollar. AIP Associate Designer Barbara Fox and United States Mint Sculptor-Engraver Charles Vickers completed the reverse design which shows a mountain goat up close with Mount Reynolds shown off in the distance. Included as well are the inscriptions of GLACIER, MONTANA, 2011 and E PLURIBUS UNUM. Both silver series are struck in the likeness of the Mint’s circulating America the Beautiful Quarters® Program, but of course feature a much larger size than the quarters. Glacier National Park was originally established as a forest preserve in 1897 with the powerful backing of the Great Northern Railway who saw the pristine landscape as an ideal vacation destination for its customers. However, proponents of the area felt that more protection was needed and pushed for national park status which it achieved on May 11, 1910 by a law signed by President William Howard Taft. Over 2 million annual visitors come to the park to take in the spectacular scenery which also includes over 700 miles of trails and over 130 named lakes within its 1 million plus acres. Most who visit take the time to drive or ride on the Going-to-the-Sun Road which was completed in 1932 and runs for 52 miles bisecting the park – the only road which does so. This road is typically closed from mid-October to early June owing to the massive amounts of snow which fall in the area.